New York, 1985: Death swings the scythe of AIDS. When Prior Walter (Justin Kirk) tells his lover Lou (Ben Shenkman) that he's ill, Lou bolts. Joe Pitt (Patrick Wilson), an attorney who is Mormon and Republican, is pushed by right-wing fixer Roy Cohn (Al Pacino) toward a job at the Justice Department in Washington. Both Pitt and Cohn are in the closet. Pitt's wife Harper (Mary-Louise Parker) is strung out on Valium, aching to escape a sexless marriage into hallucinations. An angel (Emma Thompson) invites Prior to be a prophet in death. Joe's mother Hannah (Meryl Streep) and a friend (Jeffrey Wright) help Prior choose. "Angels in America" focuses on two troubled couples, one gay, one straight: Louis (Ben Shenkman) and his lover Prior (Justin Kirk) - and Mormon lawyer Joe Pitt (Patrick Wilson) and his wife Harper (Mary-Louise Parker). After the funeral of Louis's grandmother, Prior tells him that he has contracted AIDS, and Louis panics. He tries to care for Prior but soon realizes he cannot stand the strain and fear. Meanwhile, Joe is offered a job in the Justice Department by Roy Cohn (Al Pacino), his right-wing, bigoted mentor and friend. But Harper, who is addicted to Valium and suffers anxiety and hallucinations, does not want to move. The two couples' fates quickly become intertwined: Joe stumbles upon Louis and they strike up an unlikely friendship. Harper and Prior also meet, in a fantastical mutual dream sequence in which Prior reveals to Harper that her husband is a closeted homosexual. Roy Cohn receives a different kind of surprise: He learns that he too has been diagnosed with AIDS. Prior's illness and Harper's terrors both grow worse. Prior confesses to his friend Belize (Jeffrey Wright) that he has been hearing a wonderful and mysterious voice; Belize is skeptical, but once he leaves we hear the voice speak to Prior, telling him she is a messenger who will soon arrive for him. As the days pass, Louis and Joe grow closer and the sexual tinge in their banter grows more and more obvious. 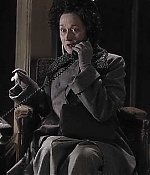 Finally, Joe drunkenly telephones his mother Hannah (Meryl Streep) in Salt Lake City to tell her that he is a homosexual, but Hannah tells him he is being ridiculous. Nonetheless, she makes plans to sell her house and come to New York to put things right. Joe tells Harper about his feelings, and she screams at him to leave, while simultaneously Louis tells Prior he is moving out. The disconsolate Prior is awakened one night by the ghosts of two ancestors (Michael Gambon and Simon Callow) who tell him they have come to prepare the way for the unseen messenger. Tormented by such supernatural appearances and by his anguish over Louis, Prior becomes increasingly desperate. Joe, equally distraught in his own way, tells Roy he cannot accept his offer; Roy explodes at him and tells him about his greatest achievement, illegally intervening in the espionage trial of Ethel Rosenberg in the 1950s and guaranteeing her execution. When Joe leaves, the ghost of Ethel (Meryl Streep) appears, having come to witness Roy's last days on earth. Meanwhile, Prior's prophetic visions culminate in the appearance of an imposing and beautiful Angel (Emma Thompson) who crashes through the roof of his apartment and proclaims, "The Great Work begins." Joe's mother Hannah comes to her rescue from Salt Lake City when Harper is picked up by the police. She finally insists that Harper join her at the Mormon Visitor's Center, where she has begun to volunteer. Meanwhile, the increasingly sick Roy checks in to the hospital where Belize works as a nurse. Belize demonstrates his considerable compassion for Prior, who tells him the full story of the Angel's visit, who gave him a prophetic book and explains that she seeks his help to halt the migratory tendency of human beings, which the Angels in Heaven believe tempted God to abandon them. God, she explains, left Heaven forever in 1906, and since then his Angels�whose vast powers are fueled by constant sexual activity�have been rudderless and alone. 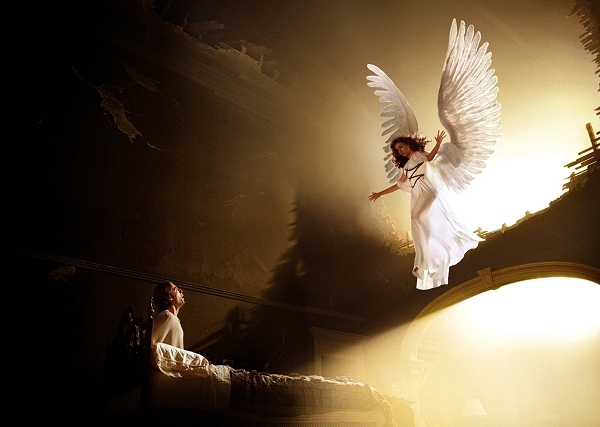 To reverse the trend, the Angel says humans must end their constant motion, their addiction to change. Not surprisingly, Prior is aghast at her words and vows to flee from her at all costs. Roy learns that his political opponents plan to disbar him for an ethical lapse, but he vows to remain a lawyer until he dies. In a friendly rapprochement, he gives Joe his blessing, until Joe reveals that he has left Harper for a man - he has been living for a blissful month with Louis. Stunned and angry, he demands that Joe end his relationship at once. Joe's wife, on the other hand, spends her days at the Mormon Visitor's Center watching a diorama of the Mormon migration featuring a father dummy who looks suspiciously like Joe. When Prior drops in to conduct research on angels, a fantasy sequence ensues in which Louis and Joe appear in the diorama. The formerly silent Mormon mother comes to life and leaves with Harper, giving her painful but valuable advice on loss and change. For the miniseries version of his Tony Award winning play, playwright Tony Kushner adapted his original text for the screen, and Mike Nichols directed. Executive producer of the series, Cary Brokaw worked for over ten years to bring the 1991 stage production to television, having first read it in 1989, before its first production. In 1993, Al Pacino committed to playing the role of Roy Cohn. In the meantime, a number of directors, including Robert Altman, were part of the project. Altman worked on the project in 1993 and 1994, before budget constraints forced him to move out, as few studios could risk producing two successive 150 minute movies at the cost of $40 million. Subsequently, Kushner tried squeezing the play into a feature film, at which he eventually failed, realizing there was "literally too much plot," and settling for the TV miniseries format. While Kushner continued adapting the play until the late 1990s, HBO Films stepped in as producer, HBO broadcast the film in six segments that correspond to "Millennium Approaches" and "Perestroika," the two parts of the original play. Kushner made certain changes to his play (especially Part II, "Perestroika") in order for it to work on screen, but the HBO version is generally a faithful representation of Kushner's original work. Kushner has been quoted as saying that he knew Nichols was the right person to direct the movie when, at their first meeting, Nichols immediately said that he wanted actors to play multiple roles, as had been done in onstage productions. Meryl Streep, for example, played a total of four roles - Mormon mother Hannah Pitt, the ghost of Ethel Rosenberg, a Continental Principality - and a Rabbi in the opening scenes of the first chapter. Hailed by critics, the New York Times wrote that "Mike Nichols's television version is a work of art in itself." 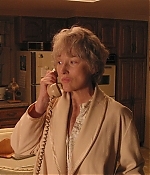 According to a Boston Globe review, "Mike Nichols, and a magnificent cast led by Meryl Streep have pulled a spellbinding and revelatory TV movie out of the Tony- and Pulitzer Prize-winning work" and that he "managed to make "Angels in America" thrive onscreen..." Besides winning five Golden Globe Awards, "Angels in America" broke the record previously held by "Roots" for the most Emmys awarded to a program in a single year by winning 11 awards from 21 nominations (the record was broken four years later by John Adams). Al Pacino, Meryl Streep, Jeffrey Wright and Mary-Louise Parker won Golden Globes and Emmy Awards for their performances. Mini-series are often described as television events - this seems to have become standard these days, no matter the quality. But for "Angels in America", it's only fitting. As it's almost impossible to describe the story of these six parts, it's as hard to find words about how challenging this series is. So my best advice is to just watch it. It covers many themes that I didn't know much about or didn't care about, and I found it thought-provoking, moving and shocking. By the end, no matter if you've enjoyed it or not, you're certain that you haven't seen anything like this before. It's Mike Nichols' masterpiece to bring Tony Kushner's Pulitzer Prize and Tony Award winning play to the small screen - although "small" doesn't do "Angels in America" justice. The acting is first rate throughout. It's so good that it's actually unfair to pick certain actors out. But some have to be mentioned. Al Pacino gives the performance of his career, he's so powerful and demanding that you hold your breath when he's on screen. Mary-Louise Parker's Valium-addicted Harper is as funny as she's tragic. Most of "Angels in America" is owned by the intense performances of the younger male cast - Patrick Wilson, Jeffrey Wright, Ben Shenkman and Justin Kirk. And Meryl Streep? It's like a showcase that she can indeed play everything! She's brilliant as the unsympathetic Mother Pitt, who slowly starts to care about the people in her life. She manages to make the ghost of Ethel Rosenberg funny. And even I, after all these years, had to look twice to see Meryl Streep while playing the Rabbi. "Angels in America" deserves all the awards it has won. I found it to be groundbreaking, reaching a new level on television from what I have seen.